So now that you have a few niches selected and jotted down, it’s time to examine them one by one. What we’re going to do is measure the potential size of each niche. Meaning… we’re going to be digging through each one to see what keywords are available, and how big they are. This is the area where a lot of people get stuck. Where do you even start? is the problem most people face. Entering in seed keywords is the way I start digging into any niche. They’re just a bunch of different topics in that niche that you input into your keyword tool. I’ll get to examples of some of my favorites in just a little bit. Based on your seed keywords, a keyword research tool is going to bring back hundreds of suggestions for you to look through. For me, I like to keep all my seed keywords informational. These are things like tips, instruction, tutorials, how-to’s, data, etc. And you should be doing the same thing. Why? Most sites out there are informational, and there is a big market for information. For instance, Sports Illustrated. WikiHow. eHow, Business Insider. Forbes. Instructables. Martha Stewart. WebMD. Search Engine Journal…. …. I could go on and on. They’re all websites that produce informational content. The market for information is ginormous, and as a result there are a LOT of high search volume keywords for information in almost EVERY niche imaginable. It’s no wonder that even sites that are selling something — SASS websites, businesses, websites for professional services, and even e-commerce sites — are turning to information-related content to attract customers through search (usually in the form of a blog). It’s just a huge market and there is always room in any niche for someone like you and I to come along and build a high-traffic site around it. I avoid e-commerce / product-related keywords because they act in kind of a different way than normal search results. You have to understand the meaning behind the search — search intent. For Instance, let’s say one of the niches you’re analyzing Is bowling. An e-commerce/product-related keyword might be something like: “bowling shoes”. It gets a good amount of searches per month. HOWEVER… an article about how bowling shoes are made, information about what they’re used for, and any other type of information type of content will NEVER rank highly for this search. Why? Because of the MEANING behind the search. 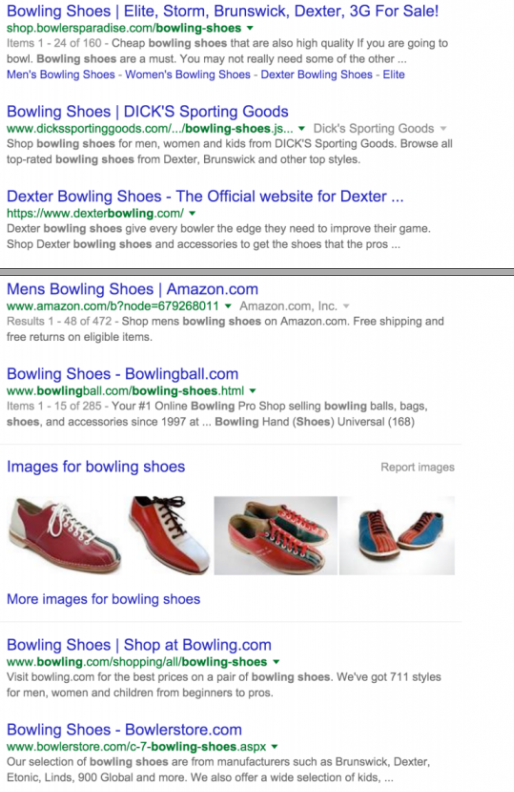 Google knows that the majority of people who search for “bowling shoes” are looking to buy. As a result, these are the search results you’ll see. As you can notice, there’s nothing but e-commerce sites on those listings. Search intent is Google’s understanding of what the searcher is looking for. It’s only going to get better and better, as Google continues to improve the quality of their search results. There are still some searches out there today that clearly mean one thing, but Google shows another thing. They’re not perfect yet, but they’re improving. As a result, it’s very important to understand search intent while you’re doing your keyword research. An informational piece of content could very well have ranked for the term, “bowling shoes’’ a couple of years ago. But as Google’s understanding of search intent gets better, they’re now nowhere to be seen for that keyword. Links have nothing to do with it. Even if a page describing whaf bowling shoes are and how they’re made had hundreds of backlinks from strong websites, they still wouldn’t appear on the first page for that search result. 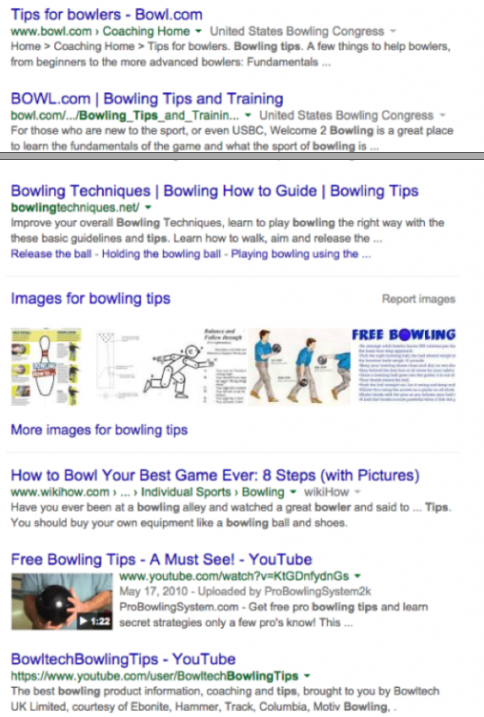 Google wants a page that sells bowling shoes. If your page doesn’t sell any, it simply won’t show up there. That’s search intent and that’s why you NEED to pay attention to it. Now, I hope I didn’t scare you there. Don’t worry. Misunderstanding search intent is pretty uncommon. Take a look at the current results and check to see what type of results are shown. Does it show nothing but ecommerce sites? That’s all you need to know, and you’ll be fine. Just remember to always keep search intent in mind as you do your keyword research. So if “bowling shoes” is an e-commerce keyword, what would be an example of an informational keyword? A better, information-related search would be something like: “bowling tips”. 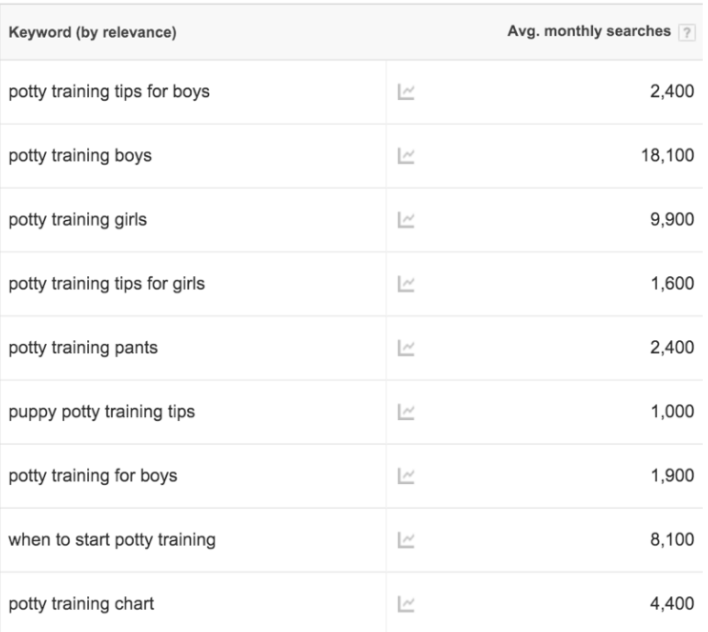 So… let’s go back to our keyword research process. We had a list of niches, and the next step was to analyze their keywords and search volume by entering In some seed keywords for each niche. For this, I’m going to be using Google’s Keyword Planner. This is the main tool I use for all my keyword research, and it’s what I’ll be using throughout this example. IMPORTANT: Google recently updated this tool to only show exact data to paying Adwords customers. If you’re not a paying Adwords customer, you’ll have to use a paid tool. You can use KW Finder. SEMrush. Ahrefs. To give you some background on these tools, KW Finder is a dedicated keyword research tool. It’s a tool meant solely for replacing the function that Google’s Keyword Planner used to give you. As a result, It’s the cheapest out of the three. SEMrush on the other hand, is multi-purpose. It’s my favorite marketing tool. In addition to a keyword research tool, it gives you data about every website on the web. It shows you exactly which keywords they’re targeting, what they’re ranking for, and how much traffic it drives to their site. It’s extremely useful in coming up (and stealing) keywords from other sites. Ah refs is an SEO tool that gives you all sorts of functionality. Aside from a keyword tool, its main function Is showing you all the backlinks any site on the web has. Whichever tool you decide to use it up to you. What we’re looking for here are BIG keywords. Are there good keywords within this niche with a big enough search volume that will make pursuing this profitable? Don’t worry about things like CPC and competition analysis yet. If you’re using a different kw research tool, just follow along there. They will all show the same results. I got these results. These are the search volumes for these keywords. And these are the additional keywords that the tool suggested below. There are 800 in total that Google’s Keyword Planner brought back. What exactly are we looking for here? This is important: Where is our cut-off point? What Is considered a high search volume keyword? My criteria for keywords at this stage is: 10,000+ searches. 10,000 is the minimum number that I would need to see to target it as one of my MAIN keywords. In this stage of the game, we’re going to ignore all the smaller keywords for now. We’re using this criteria to measure the size of the niche, and the potential traffic we can drive to our site by measuring the biggest ones. Think 10,000 is a lot? It’s not. My criteria used to be 50,000. But that really narrowed down the potential niches you can go after. But with recent conditions, 10,000 seems to be the better target number. Instead of creating massive pieces of content that are over 5000 words long, it’s better to reduce our target metric and instead create more content targeting more keywords. IMPORTANT: I don’t mean 50,000 searches for a single individual keyword. This might sound a little confusing right now, but I’ll explain everything in the unit after the next one. I’m going to show you one of the MAIN STRATEGIES that I use that allows me to build more traffic to my sites than any of my competitors. Apart from link building, I give credit to this strategy for the reason why I was able to cross $10,000/month. And I can’t wait to show you how you can use it for your own sites. Let’s move onto the next lesson!